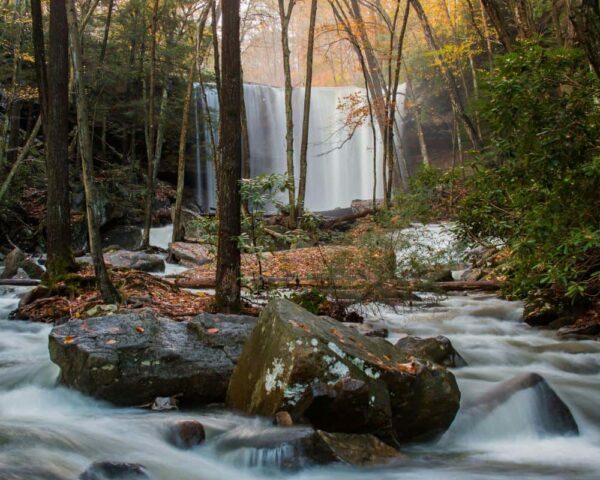 In many ways, Cucumber Falls might be one of the best waterfalls in Pennsylvania. 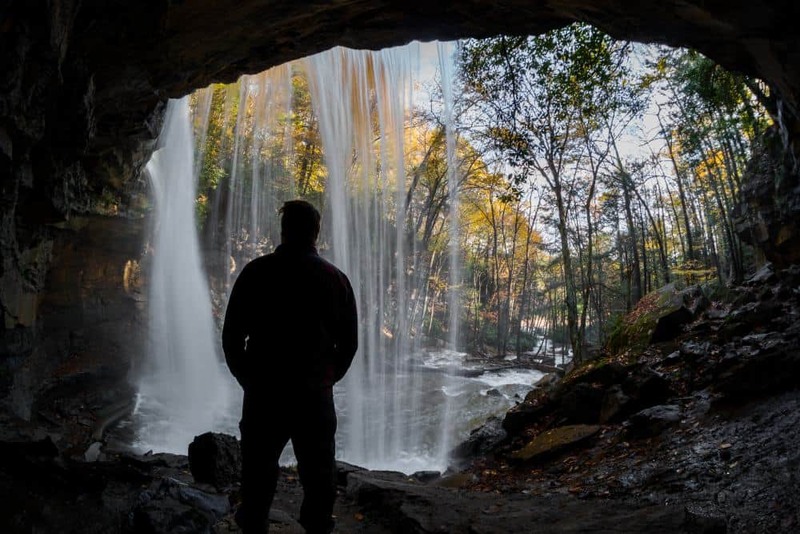 Not only does the water cascade over a 30-foot drop, but it is also super easy to visit. The only other waterfall in Pennsylvania that I can think of that gives you as much bang for your buck is Dingmans Falls in the Delaware Water Gap region of the Poconos. 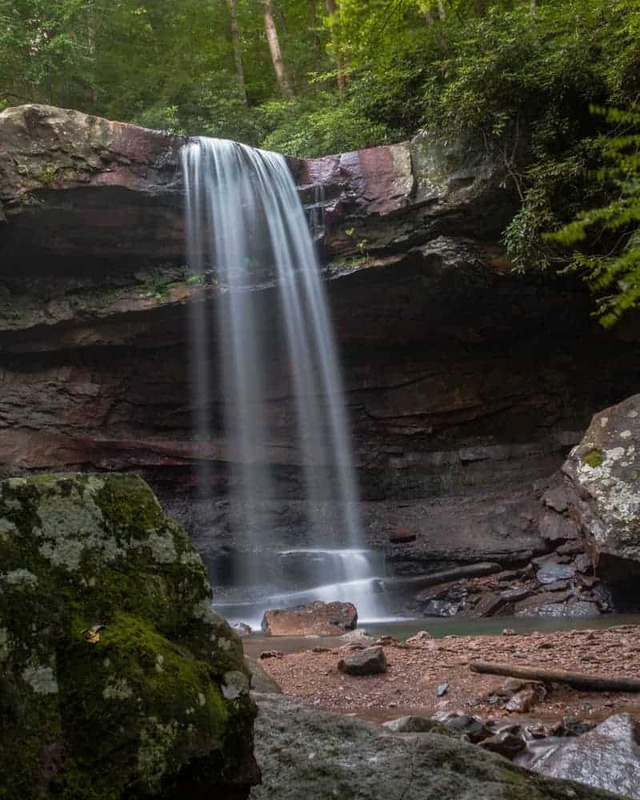 Located in Ohiopyle State Park, Cucumber Falls is one of at least a half-dozen great waterfalls in the park. However, if you only have time to see one waterfall in the park, this is the one to see. When visiting Cucumber Falls, park your car at the small parking area at the Cucumber Falls trailhead. Once parked, you will be roughly at the top of the falls. Downstream of Cucumber Falls at a time of particularly high water. 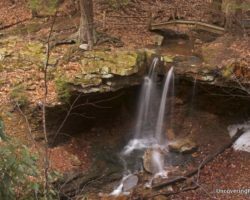 Walking down the trail for less than a minute will afford you a great look at Cucumber Falls from above. To get to the bottom, simply descend the few dozen stairs to the bottom of the falls. 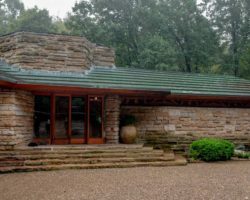 From this point, you can either continue closer to the falls or follow the stream a few hundred yards until it flows into the Youghiogheny River. Standing along the river bank is a great place to watch boats as they take a momentary breather between two sets of rapids along the river. 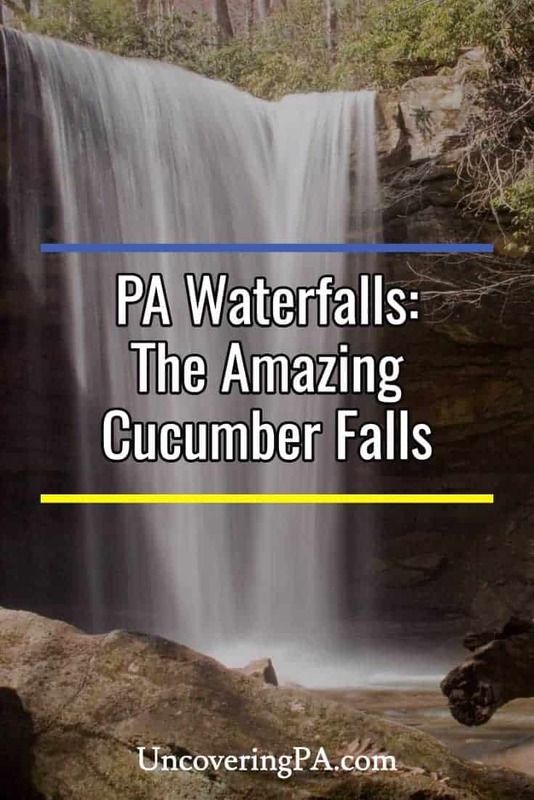 If you opt to head closer to Cucumber Falls for a closer look, make sure to use caution as the rocks can be more slippery than they appear. However, getting closer to the falls will give you a great opportunity to better appreciate their beauty and power. If you want, you can even relax in the shallow pool below the falls or clamber behind Cucumber Falls for an even more unique viewpoint. Looking out from behind Cucumber Falls. Cucumber Falls is definitely one of my favorite waterfalls to photograph. There are many unique angles that you can get amongst the boulders and trees that dot the landscape around the falls. 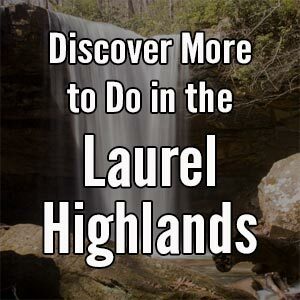 However, it’s also a worthwhile place to visit even if you don’t like waterfalls or hiking. 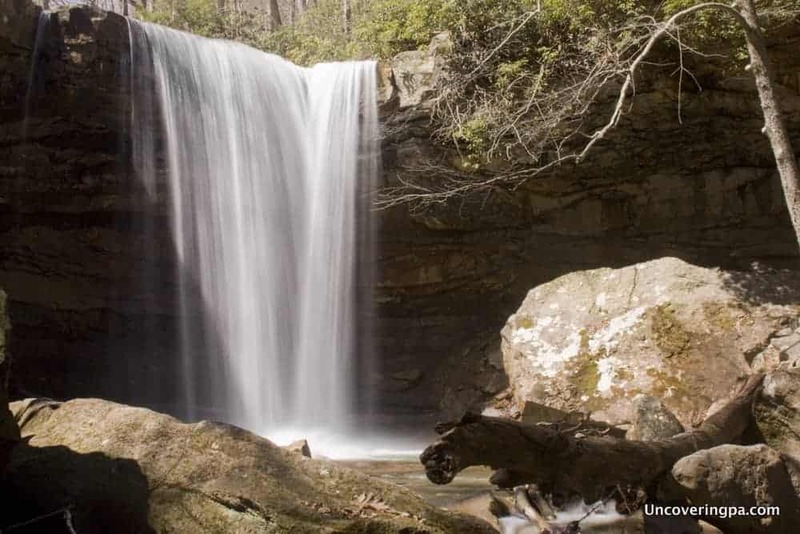 Overall, I can’t see any reason not to visit Cucumber Falls if you are visiting Ohiopyle State Park. 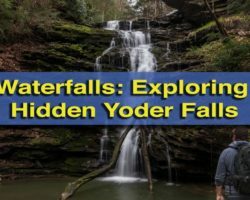 It really is one of Pennsylvania’s most breathtaking waterfalls and is incredibly accessible. Cucumber Falls looks great even at times when less water is flowing over the falls. 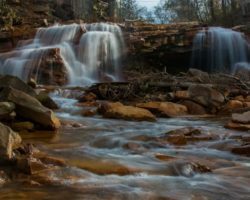 Visiting Cucumber Falls is very easy if you know where you are going. 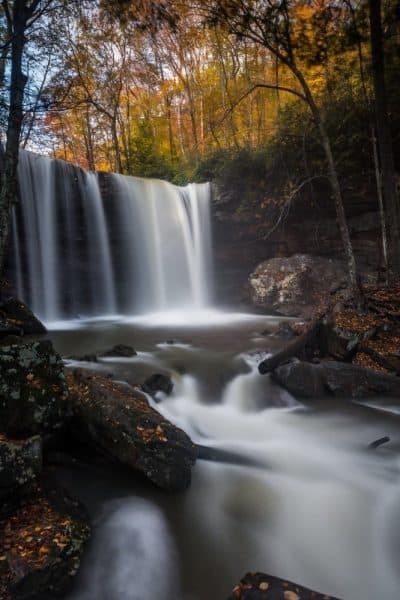 The waterfall is located in Ohiopyle State Park in Fayette County, Pennsylvania. If you are using a GPS, the coordinates for Cucumber Falls are 39.862803, -79.502713. From there, it’s less than a minute walk to the top of the falls and only about a minute more to the bottom. Another look at Cucumber Falls after a lot of rain. Want to see more of Pennsylvania’s best waterfalls? 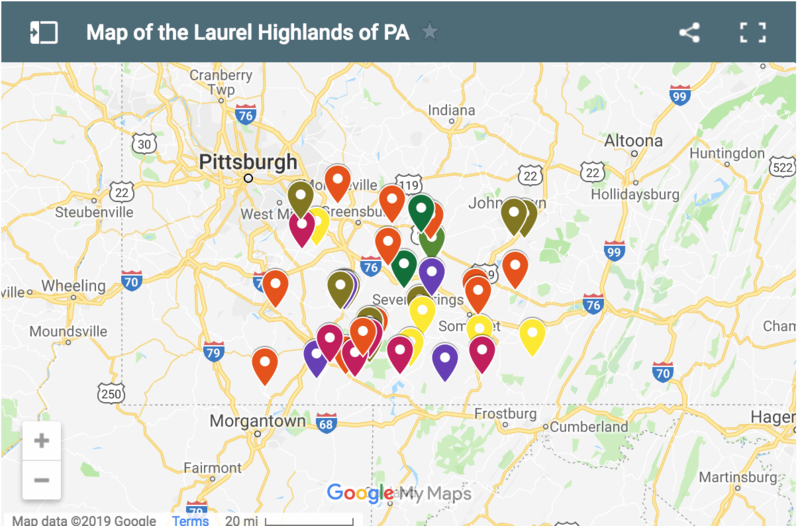 Visit our Pennsylvania Waterfalls page! Or, try an Ohiopyle white water rafting trip to see the area in a whole new way. Those are good shots Jim. Well done mate! These are excellent shots, my friend!